Twin State Speedway is a 1/3 of a mile short oval located in Claremont, NH. The track also has a figure 8 layout. I used Google earth to get the shape of the track perfect. Details are not the best. Track was made to reflect the new construction done at Twin State Speedway. I was more worried about getting the shape of the track perfect instead of all the details around the track. Track was made from scratch by myself using Google earth as a reference along with hundreds of photos of the track and with input from drivers that race there. 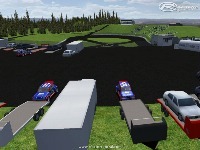 There are currently no setups for Twin State Speedway 2010. Add a Setup. why would anybody want to dl 142mb when the track can be packed to 69. if it was actually completed then most likely under 30mb. This a mistake. The 2010 version was made from scratch by myself. The first Twin State Speedway track was made by cashewboy and it was done very well. Just before the start of the 2010 season the track was repaved and a wall was put in all the way around the track. The 2010 version I made was put together in about an hour and all I was worried about was the surface of the track. I am not taking any credit for cashewboy's work and anyone that races on the new track will clearly see there is no way I edited his version. I would like this mess sorted out so both version came be up for download as 2 seperate tracks.